I got this card through an even-up trade with my friend Pete a few weeks ago. We were walking the length of Victory Boulevard in Staten Island. Some people climb mountains, some jump out of airplanes, some lie on beaches with umbrella-topped drinks in their hands. We walk. We started walking down long streets in one or another of the five boroughs years ago, before I moved away from New York City. Our first excursion was to walk the length of Metropolitan Avenue from the East River in Brooklyn to its ending point at a busy intersection several miles away in Queens. It was Pete’s idea. He’s a gifted traveler, someone who can look at any map and see adventure. He promoted the idea for a while, often over beers and with a jukebox backing him, using his gift for mythologizing the world to make Metropolitan seem like it would be as fraught with uncertainty and revelations as a foray into the Forbidden Zone. In fact, speaking of the Forbidden Zone, I am fairly certain that on more than one occasion Pete hyped the potential excursion by reenacting and slightly altering the ominous exchange of dialogue near the end of Planet of the Apes, just after the loin-clothed Charlton Heston has trotted off on his horse down the beach. Pete (as Zira): What will they find out there, Dr. Zaius? Pete (in the oracular voice of Zaius): [Long pause] Their destiny. As the years went on, we continued exploring. We walked the length of Bedford Avenue (passing, among other things, the site of Ebbets Field, now just a parking lot with a small plaque), walked the length of Kings Highway, and walked across the Bronx from the Hudson River to City Island. A few miles into the most recent walk, down Victory Boulevard, we stopped at an arcade searching in vain for some miniature golf. We came upon a small sports card store and each bought a pack. A little while later we sat on a guardrail by the side of the road and ate sandwiches. When we were done eating we opened our packs, as if looking for a message inside a meal-ending fortune cookie. I didn’t get any cards of guys on my team, the Red Sox, and Pete didn’t get any cards of guys on his team, the Mets, but I got oft-injured Mets centerfielder Carlos Beltran. “Trade you,” I said. I held up Beltran. He didn’t have any Red Sox, so I settled for Southpaw. 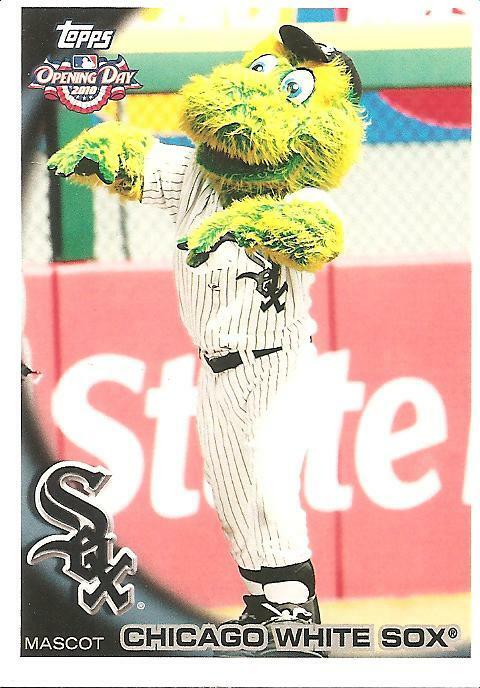 I don’t have a particular connection to the White Sox mascot, other than that now I live in the city where he plies his trade. He’s about as bland a mascot as you could imagine. But even so, I feel like my shoebox is a little richer now, since Southpaw came to me in a trade with my friend. You are currently browsing the archives for the Southpaw category.